On 18th May, a group of 11 surgeons and endometriosis specialists will cycle 220 miles in two days to raise money for Endometriosis UK. 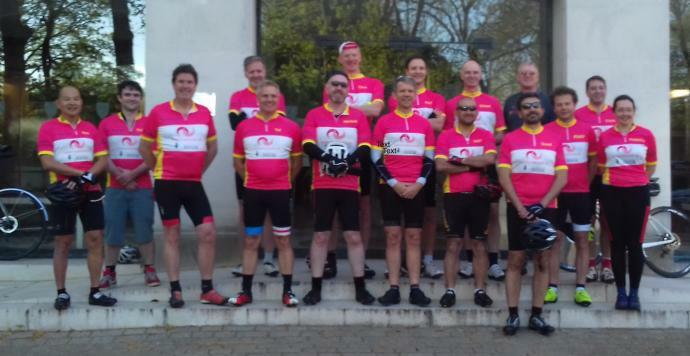 From London to Newport (where the annual British Society for Gynaecological Endoscopy (BSGE) conference takes place), the cyclists will stop off at least 7 endometriosis centres and finish at the University Hospital of Wales in Cardiff. Organise an Endo the Night Party during Endometriosis awareness month and help support women with endometriosis. What is an Endo The Night Party? You can get involved in our awareness month and raise money for Endometriosis UK by organising a big night in with family and friends. Join the Endometriosis UK cheering team for The Great British 10K! Help us cheer on our wonderful fundraisers, who are running The British 10K for Endometriosis UK! Read more about Join the Endometriosis UK cheering team for The Great British 10K! Find out how our brave fundraisers got on when they tackled Mount Snowdon! Endometriosis UK Brighton Marathon runners power to the finish line! Find out how our wonderful Brighton Marathon runners did and how they achieved their personal goals. Read more about Endometriosis UK Brighton Marathon runners power to the finish line! Follow our step by step guide to help you reach your fundraising target and become a fundraising super star! Achieve something wonderful with the Pink Pants Snowdon Horseshoe Challenge! We’re quickly approaching our first Pink Pants challenge for this year – The Snowdon Horseshoe Challenge. Read more about Achieve something wonderful with the Pink Pants Snowdon Horseshoe Challenge! Register for the Million Woman March for Endo! Drum roll…. Registration for the Million Woman March for Endometriosis 2014 UK event is now open! Read more about Register for the Million Woman March for Endo! Read about our X-London Pink Pants challenge takers who marched from Greenwich to Richmond in their fabulous pink pants.